US Media continues its campaign against “fake news,” urging people to only listen to mainstream, pro-western capitalist news sources, despite their documented record of factual inaccuracies. US media coverage around anything related to the Democratic People’s Republic of Korea is a great example of media bias and deception in practice. Sometimes US media is caught blatantly reporting false things about the DPRK, such as the outrageous claim that Kim Jong-Un executed someone by feeding them to a pack of wild dogs. This was proven to be fake, or untrue news. However, most of the manner in which the US public is deceived about the DPRK is more subtle. For example, most Americans believe that the economic system that is in place in the northern half of the Korean peninsula has been an absolute, total failure, and caused nothing but mass starvation. This is demonstrably false. The Country Study of the DPRK published by the US Library of Congress goes into detail describing the economic achievements of the country, including housing, literacy, self-sufficiency and access to medical care. Mass food shortages and famine took place in the DPRK during the 1990s. In the aftermath of the Soviet Union’s collapse, the DPRK was unable to import oil, on which the country’s food system was very dependent. Within the DPRK, this period is known as the “arduous march.” The government blames sanctions from the United States for the food crisis. However, when reporting on North Korea, American media emphasizes the “arduous march” period, and omits the “economic miracles” of the 1960s. Furthermore, the causes of the food crisis of the 1990s are never explained. A single episode of mass starvation during the 1990s does not accurately represent the entire experience of socialist construction in northern Korea. Furthermore, the audience is led to believe that the only factor is the failure of socialist economics and mis-leadership by the Korean Workers Party. Usually no other factors, such as sanctions, lack of arable land, drought, flooding, etc. are discussed. The other example of lying through omission and emphasis relates to nuclear proliferation. North Korea withdrew from the Nuclear Non-Proliferation Treaty on January 10th, 2003. It understood now that the country possesses nuclear weapons. But why?American media ignores, omits, or de-emphasizes the entire context of the DPRK developing nuclear weapons. The audience is led to believe that the DPRK randomly developed nukes out of a desire to attack the United States or threaten its neighbors. Let’s go over the omitted background of the story of nuclear proliferation on the Korean Peninsula. During the Korean War, millions of Koreans died. Some estimate that roughly 30% of the population of the DPRK was lost. Every building above one story high was destroyed. During the war, the United States was openly considering the use of Nuclear Weapons against both Korean and Chinese forces. Douglas MacArthur even made these threats publicly. North Korea first ratified the Nuclear Non-Proliferation Treaty in 1985. In 1993, they threatened to withdraw. At the time, the country was facing an episode of mass starvation, amid US threats, sanctions, and the loss of their Soviet allies. 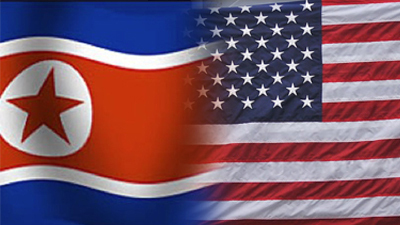 Negotiations between the US Government and the DPRK took place, and DPRK did not withdraw. In 1994 the “Agreed Framework” was established between the United States and North Korea. It was understood that North Korea would be given agricultural aid, heating oil, and the US would move toward having diplomatic relations with North Korea, all in exchange for nuclear non-proliferation. However, the United States never fulfilled its end of the bargain. US Congress blocked the implementation of the deal which the Clinton administration had negotiated. In this context, the DPRK dropped its obligations under the agreed framework as well, and ultimately developed nuclear weapons. US media of course leaves out this entire chain of events. Korea’s leadership agreed not to develop nuclear weapons in exchange for food for their starving population, as well as other humanitarian support, in a time of mass starvation. US leaders did not fulfill their promises. Very little food and heating gas was ever delivered. In this context, is it a surprise, or a moral outrage that North Korea would also drop its end of the bargain, and go ahead and pursue nukes? Does such an action really fit the narrative of a “rogue state” lead by “insane” leaders bent on destroying the planet? When a few basic facts are mentioned, the entire narrative and perception of North Korea falls apart. The DPRK hasn’t always had mass starvation, and according to even rather hostile sources like BBC and the Council on Foreign Relations, its economic system was quite successful at one time. Furthermore, the DPRK developed Nuclear Weapons only in response to the failure US leaders to fulfill their obligations under a negotiated agreement. They were promised certain things in exchange for not developing nuclear weapons. They did not get those things, so they went ahead did it. These facts are conveniently forgotten in any discussion of the DPRK, but they are highly relevant to understanding the country and its relationship with the world. While ignoring important aspects of reality, these news sources talk of “fake news” and urge us to listen exclusively to them? That’s probably not a good idea, especially for those who want peace.